Ten days to go. Two hundred and forty hours before the inland waterways network exploration begins in earnest. The days are flying by now. There’s a part of me wanting the countdown to progress a little slower. Giving up a job which you love and which pays all the essential bills is a little scary, but I’m sure we’ll get by. Sally hasn’t worked since she left for her six week trip to the Philippines at the beginning of January. She’s not quite adjusted to having to rely on me financially or the need to watch what we spend. We’ve spent the last four years buying whatever we want whenever we want. Living on a fairly tight budget isn’t something we’ve quite mastered yet. The budget is going to be even tighter in just over a week’s time when I join Sally and give up my full time job. There’s still a large number of incomplete tasks on my groundsman to do list but no sign yet of a replacement for my position. Fortunately Pat and I don’t have to worry about grass cutting yet. The relatively cold weather recently has kept the spring’s growth at bay. Cutting the grass on the site’s landscaped section of the one hundred and ten acre site during the spring and early summer is almost a full time job in itself. By this time last year we’d already been furiously cutting grass for two weeks. There’s plenty of grounds maintenance work to do but with just fourteen days to go before Easter and the start of the hire season Pat and I are often side tracked to help Caclutt Boats’ fitters, engineers and wharf staff prepare our own twelve strong hire fleet and the four narrowboats we look after for the Royal Navy. Over the last seven days I’ve spent much of my time moving boats around the marina or taking refurbished and repainted hire boats from the marina up through two locks to the wharf where they’ll be moored for the season between cruises. It’s a very pleasant way to earn a living. Between dashes off the site to collect steel from a supplier in Long Itchington and to and from Braunston to have a new rudder cup made I’ve been doing a little work on the grounds. I spent a few hours removing truck loads of invasive brambles from the bank above the channel on the canal side of the norther perimeter of Locks marina where I’m now moored and tidying up the straggly willows growing over the run off from the old single lock. On Friday Sally and I had a lazy day. Neither of us are very good at them. If there’s rushing around to do, we generally rush around with a vengeance. Friday was a beautiful day without a breath of wind on two usually very blowy marinas. We pottered around in the morning, Sally in the boat with washing machine, vacuum cleaner and duster and me in the engine room thinking about doing manly things but doing little more than tidying shelves and watching a crested grebe fishing for lunch. At midday we drove to Napton post office to buy something for lunch. The business has been transformed since it changed hands a year ago. The previous owner struggled to raise a smile or stock a shelf but the new people couldn’t be more different. They’ve refurbished the interior and incorporated a small cafe but more importantly, they make their ever increasing volume of customers feel very welcome. We bought a couple of baguettes stuffed with thick wedges of succulent beef and dripping with horseradish. We added a pack of chilli cheese, cheese biscuits and a jar of sweet garlic pickle. We drove back to the boat and eat the lot sitting at the picnic table next to the boat, basking in the spring sunshine while watching a steady stream of boats negotiating the bottom lock. Friday was the calm before the storm. On Saturday I spent four hours in the morning scaling the north face of the office building wire brushing the white painted bricks ready for its smart new coat on Monday. I dashed back to my boat at 1pm, fired up the engine, untied myself from the dump barge and cruised four hundred feet across the marina to the slipway. Three years ago I took the boat out of the water to paint the hull. Three years is long enough between repainting for bitumen covered hulls so this weekend was the perfect opportunity to cover the scrapes and scratches accumulated during recent cruises, including the bright red line of rust along the water line caused by ploughing through the ice on our New Year cruise. Removing the boat from the water is a fairly straight forward task. Our ancient site JCB pushes a wheeled flat bed trailer down the slipway and in to the marina. The boat helmsman steers the boat towards the slipway aiming between the trailer’s four corner posts which stand a foot above the surface of the water when the trailer’s submerged. As the boat moves slowly into the space above the trailer bed, the JCB driver reverses the JCB pulling the trailer with, hopefully, the boat sitting on top of it in the right position. Once the boat is safely on the slipway the hull is pressure washed to remove the organic growth then given a thorough scrubbing with a man sized mains powered wire brush to remove any loose paint and to key the surface ready for the new bitumen. Once the hull has dried, any rusty areas, normally along the water line, are treated with Miogard anti-corrosion paint before two or three coats of bitumen are applied. With my boat safely out of the water I could get on with the dirty job of hull blacking and tackle a few other essential out of the water maintenance jobs. My rudder needed some remedial work. The cup which the rudder rests in had worn so often when I turned the tiller the rudder would slip across the cup with a grating squeak. The worn cup isn’t detrimental to boat handling but the noise is slightly annoying. I also needed a new set of sacrificial anodes. I don’t know when they were last replaced but they haven’t needed doing in the five years that I’ve been on the boat. I was hoping to get them fitted on Sunday but there wasn’t an engineer available. Last on the list of slipway jobs was to repaint the tunnel flashes, the two brightly coloured bands around the boat’s stern. One band is often white, the other red. However, looking across the marina now I can see white and blue, yellow and black and a rather fetching cream and pink. My tunnel flashes were quickly and poorly painted when I had the boat out of the water three years ago. I ran out of time and the energy to paint them properly so the paint on the lower flash was quickly covered in bitumen and the top flash repainted in cream very quickly. I asked our then boat blacker Johny to paint the tricky flash curve for me but he was having an off day. The same standard could have been easily achieved by a blindfolded chimpanzee. With the boat safely on dry land the first job was to pressure wash the hull. The work took an hour which included removing the weed hatch to give that a thorough blast too. Any flaky bitumen then had to be removed with a powerful electric wire brush. Another hour and a pair of aching shoulders later the hull was ready to treat with Miogard. Unfortunately the Miogard had to wait. The first of this season’s hirers arrived at 4.30pm, running late, slightly stressed and eager to begin their holiday. 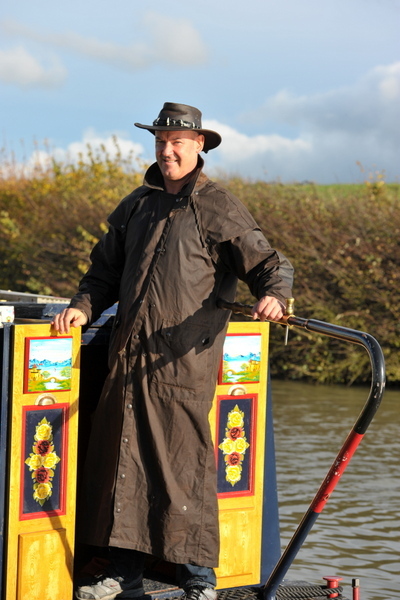 By the time I had discussed the best route for them, walked them through the boat and taken them through the top lock to where they wanted to moor to wait for guests dusk was upon us so we retired to a warm and comfortable cabin and drank wine instead. On Sunday morning I started painting at first light. A very eager Sally joined me at 8am more than happy to do her share and, I have to admit, looking very fetching in a too large pair of blue Calcutt Boats overalls. Sally’s first job was to point out all the bits I had missed. She’s much more thorough than me so we made a good team. I did the donkey work, splattering everything in sight with thick tarry Miogard. Sally followed me smoothing out the drips and runs and cutting in to the Mauritius Blue gloss on the gunnel very neatly indeed. We had a quick visit from Dale Willoughby. He came to take measurements for a new rudder cup to replace the rather worn original. He came to the conclusion that the rudder would need to be cut off to get at the cup so suggested a temporary fix he tried very successfully on another boat with a worn cup twelve years ago. He told me to make sure that the rudder was sitting in the middle of the worn cup then pack the surrounding gap with stern tube packing and grease. After Dale left, I spent an hour with a screwdriver and lump hammer forcing as much packing as possible into the cup. I won’t be able to tell is the repair has been effective until the boat is back in the water. If the solution doesn’t work, I’ll probably wait another three years until the boat is out of the water for blacking again. Soon after Dale left, Rob arrived to work on the tunnel flashes. On the first of his four visits he sanded the thirty eight year old much abused hull steel as flat as possible and applied an undercoat. After two more visits to apply two more coats to the cream and red flashes he spent the last hour of the day hand painting the curves on the flashes. The flashes are finished now and are a huge improvement on the mess that was there before. Sally and I finished painting the hull in Miogard by 11am. The rust treatment is usually just used to spot treat bare metal, usually along the water line, but I decided to cover all of the hull with it for maximum protection. Had I known at the time that Miogard is three times the cost of bitumen I would have been a little more economical with the roller. We decided to eat out as a reward for the morning’s hard work so we drove five miles to Staverton to the Skylark Farm cafe for brunch. After two farmers’ breakfasts we popped into Calcutt Boats’ chandlery to buy two ice creams which we enjoyed sitting in the sun on the garden decking overlooking Calcutt Top Lock. We spent a couple of pleasant hours in the afternoon putting the first coat of bitumen on before downing tools for the day and climbing the steep steps up to our home high above the surrounding boats in the marina. Our home doesn’t feel quite the same at the moment. Of course, the view is different. We’ve moved away from the tranquil setting next to the bottom lock we’ve become used to since we moved on to the dump barge mooring two weeks ago, but we’re only here for three nights so that doesn’t bother us. Another change which is of far more concern is the shape of the boat. It appears to have bent slightly. The boat is sitting on the slipway trailer on two railways sleeper covered bearers thirty feet apart. The hull appears to have flexed slightly in the middle. The door to our bathroom is now catching on the sill when it opens and the bottom draw in the five draw chest next to it won’t open at all. I’m hoping that the steel will spring back into shape when the boat’s back in the water on Tuesday or we’ll have to consider renaming it The Banana Boat. On Monday morning after a frantic couple of hours work at my laptop to get the newsletter out I had to go to work leaving Sally to apply another coat of bitumen. What a girl! She told me that she’s enjoying blacking the hull and that there’s no point in me taking time off work when she has all the time in the world to do the painting. I’m really happy that she’s prepared to roll up her sleeves and tackle the dirty jobs. She’s champing at the bit to start touching up the cabin paint. I’m sure she’ll do a better job than me. I wonder if I can persuade her to tackle the engine bay? I said that there were only two companies I knew which offered boats for hire for months at a time rather than for a holiday week or two. One of those companies was Sheffield Narrowboats. They offered well appointed boats to the top end of the market. 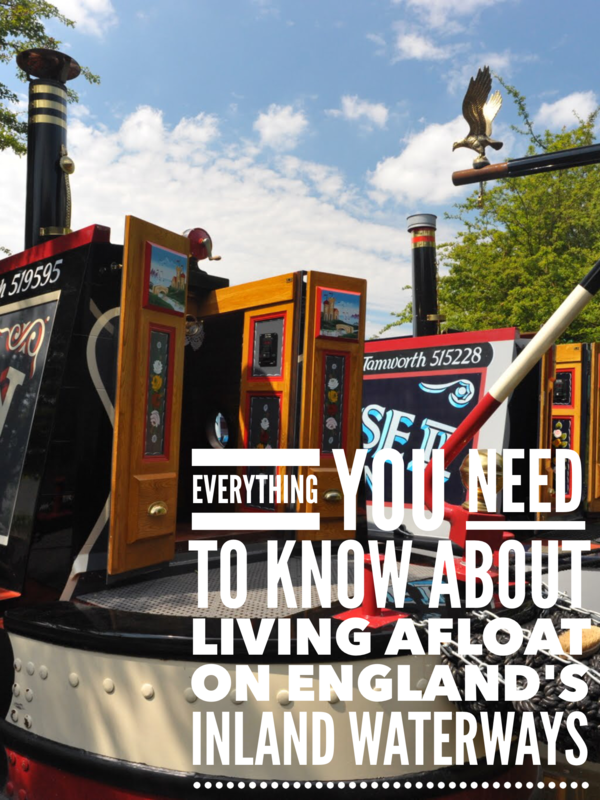 With the monthly rental charge ranging from £2,000 to £3,000 their boats weren’t a realistic proposition for most people thinking of living afloat but even if the cost didn’t put you off they’re sadly no longer an option. Tony Bowyer emailed me a few days ago to inform me that Sheffield Narrowboats ceased trading last year. He contacted them after reading my article. If you want to live afloat you’re just going to have to start saving your pennies.